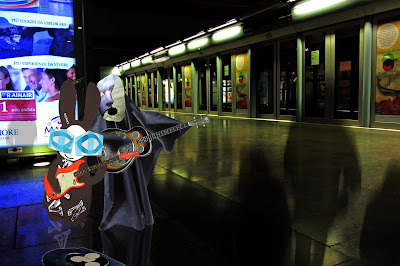 The Wabbit and the Phantom searched the Metro high and low, without success. They scoured every platform and every doorway, but no portal appeared. "Maybe we could conjure it up?" suggested the Wabbit. He produced two guitars from his fur and offered one to the Phantom. "Give me a note," he said and he strummed a few chords. The Phantom produced a credible note and the Wabbit nodded his head. "We can't find the Phantom's labyrinth," he sang; "And we don't know what to do." The Phantom bottle-necked the strings and slid up and down the frets. "So we’re stuck here for eternity, as the trains come rumbling through." A train arrived at the platform and the doors slid back with a whoosh. The Wabbit grinned and tapped his feet. "Metro trains go up and down. And that ain't nothin' new. But the labyrinth lies so deep below. It can never be in view." "Oooh Oooh," chanted the Phantom. "Oooh oooh," sang the Wabbit. Passengers came and went - and as they passed, they threw down money. "How much have we made?" murmured the Phantom. "About 25 euro," said the Wabbit. "Let's do it again," said the Phantom. With a twang of his guitar he launched into another tune. "If I can find my labyrinth, an opera we will score." "We'll make a lot of money," yelled the Wabbit; "and we won't have to work no more." As the money piled up, the platform shimmered and passengers dissolved into shadows. The Wabbit felt a heavy pull on his fur. He leaned towards the Phantom. "I think we found your portal." That was when they vanished - and the money with them.